The Watford 10k was advertised as a bluebell run (one of the many that crop up around the UK at this time of the year), combining a race with a scenic canter through some springtime floral highlights. I’d signed up for the race at the last minute, having only just heard about it on Twitter and fancying a laid back race over the bank holiday weekend. Before I get carried away with recounting my race, the course was stunning, and the race was well organised. There were plenty of marshals around the route, the water station served on both sides in preparation for the crush of runners, and it’s pretty good value for money. Definitely one I’d do again. And if you’re looking for results from the race, they can be found on the Sports System website here (at the time of posting, they’re not yet available on the race website). Having arrived in good time, I saw the 1km kids’ race run in advance of the adults’ 10km race and had a decent warm-up, all the while pondering whether I should have remembered to apply some suntan lotion. Fortunately there were enough trees in the runners’ village and around the route to reduce the risk of sunburn. Once the runners were called to the start line, we were escorted to the top of the park. There were around 860 runners, all gathered on the narrow paths of the park, so once it got congested and it was difficult to move forward and stay on the path I decided that I’d just use the crowds as a way of moderating my pace over the first couple of kilometers. After all, I thought, there’s chip timing, so that’ll probably mean a real time as well as a gun time. A klaxon blared and we started to shuffle towards the start line. People started jogging, as did I, still moving towards the start line. As the field started to spread out I started to move past other runners, still headed for the start line. After a while I lost faith that there would be an easily definable start line and so started my Garmin. 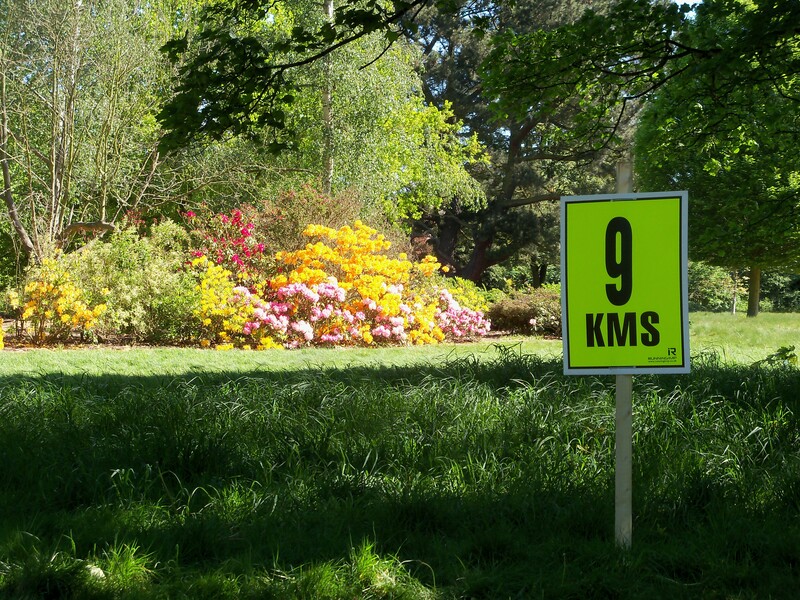 A while after we passed a chip timing mat, the timing clock (displaying something like 3:26) and a couple of hundred metres later passed the 1km sign. The race had definitely started, so I ran on the verge of the path, overtaking a number of runners. My race target had been to finish in around 40 minutes. Having come unstuck strategically at the London Marathon less than a month ago, I planned to take a steady pace and focus on consistency without burning out. I’d read the word ‘undulating’ and the coy phrase ‘hilly even’ in the course brochure, but had (perhaps arrogantly) decided that the organisers were probably referring to some lumps and bumps, rather than real hills. Sure enough, just 2km in we started a descent into the woodland, and shortly after we were on trail paths rather than concrete. I leant into the downhill, letting gravity do the work and conserving my energy for the inevitable upward slog. When the upward slogs came, they were generally short and sharp. Lean in, shorten stride, swing arms, I thought. By this time the runners had thinned out and I was generally chasing a string of club racers. Over the uphill stretches I was able to overtake a few other runners and managed to maintain the advantage on the downhill, sometimes overtaking on the way down too. I can only think that the hilly mile repeats in Finsbury Park have helped me work out a decent approach to hills, and the marathon training has done wonders for my recovery. Not really knowing when I’d be confronted with a hill made me keep my pace in check much more than I was likely to over a course I know well (compare and contrast this race with the Oxford Town & Gown in two weeks’ time). However, once out of the woods (literally, not metaphorically) and having passed the 8km mark, I felt more confident in pushing on. Come the 9km marker and I was closing in on two runners immediately in front of me. With the finish line in sight, one of the runners I’d passed only seconds before surged past me. I kicked it up a gear and managed to take him just at the finish line, coming in at virtually 40 minutes on the nose (40:01 according to my chip time). Certainly not my fastest race ever, or my hardest run (I’d say most of it was at a comfortable-but-fast pace), but I was pleased with following through a planned strategy. This called for a celebratory isotonic (ice-o-tonic?) ice cream.